The People’s Democratic Party (PDP) seems to be in a difficult political situation with the presence of heavyweight presidential aspirants who all hope to dislodge the governing All Progressives Congress (APC) in 2019. The defection of strong politicians from the APC in addition to the existing bigwigs has formed a heavy storm in the PDP as majority of those rejoining the party is believed to have axes to grind. There is tension in the party, especially as the number of presidential aspirants has continued to increase. They include; former vice president Atiku Abubakar, governors Aminu Tambuwal of Sokoto, Hassan Dankwambo of Gombe, Senate President Bukola Saraki, former Senate President David Mark, former governors Rabiu Kwankwaso of Kano, Sule Lamido of Jigawa, Ahmed Makarfi of Kaduna, Ibrahim Shekarau of Kano, Attahiru Bafarawa of Sokoto, Jonah Jang of Plateau, Donald Duke of Cross River, former Minister of Special Duties Kabiru Turaki, founder of Baze University, Sen. Datti Baba-Ahmed and Chief Alfa Muhammed Oliver. Former vice president Atiku Abubakar, the Wazirin Adamawa, is not a new comer in the game. In 2007, he ran for the presidency on the platform of the defunct Action Congress (AC), where he came third behind incumbent president, Muhammadu Buhari, and late Umaru Musa Yar’adua, who won the election. In 2011, he contested for the PDP ticket with former president, Goodluck Jonathan. He left the PDP to support Buhari against Jonathan in 2015. Late last year, Atiku returned to the party in preparation for next year’s elections. The former vice president is a proponent of restructuring, a campaign tool that has been embraced mainly in the South-south and South-east. Atiku is believed to have a wide political network across the country, and enjoys huge support from the two zones. Governor Aminu Tambuwal of Sokoto State formerly of the APC before his recent defection to the PDP, is believed to have commenced surreptitious campaigns earlier ahead of 2019 general elections as he once received the blessing of former military president Ibrahim Babangida. Babangida in April 2013, subtly endorsed Tambuwal for the 2015 presidential race by describing him as a beacon of hope and a representative of a generation that may yet ensure that the labours of the nation’s heroes past are not in vain. The former military president who spoke in Lagos at the investiture of former Rivers State governor Rotimi Amaechi and Mr Aigboje Aig-Imoukhuode as Vanguard Newspaper ‘Personalities of the Year 2013’, expressed confidence in Tambuwal when he was the House of Representatives speaker. Last year, former president, Olusegun Obasanjo, who also said Tambuwal won his heart with his performance as speaker, described him as an example of a successful youth in politics. But his political credentials are considered inadequate for the 2015 presidential polls since he has continued to rely on the political structure of former governor Aliyu Wammako. With his decision to leave the APC, he seems to have expressed readiness for the nation’s coveted job, and there is no doubt that he has contacts throughout the federation. Alhaji Sule Lamido, a former governor of Jigawa State whose presidential ambition cannot be dismissed with a wave of hand, enjoys massive followership. He is a key follower of former president Olusegun Obasanjo who was said to have to preferred him as the PDP candidate in 2015 before Jonathan violated the unwritten zoning arrangement in the party, an action identified as major cause of the party’s defeat in 2015. The main selling point of Senator Ahmed Makarfi, a former governor of Kaduna State, is the role he played in the restoration of peace in the PDP when he was chairman of the caretaker committee. It was under his watch that the party was reclaimed from Ali Modu Sheriff. Despite the fact that he left Sir Kashim Ibrahim House in Kaduna 11 years ago, he still wields enormous powers in the state PDP. Some stakeholders say he is more powerful in the party than former vice president Namadi Sambo, also from Kaduna State. Reports say after the party was reclaimed, Governor Nyeson Wike of Rivers State pledged to reward Makarfi with the PDP presidential ticket. 62, has a very bright chance of clinching the PDP presidential ticket. If the result of the 2014 presidential primary of the APC would be the yardstick for selection of the PDP presidential candidate, Rabiu Kwankwaso stands tall among other aspirants. Kwankwaso, the leader of the Kwankwasiyya Movement, came second to Buhari in that contest, a feat that propelled his popularity. The 61-year-old lawmaker was among those who left the PDP for the APC in the run-up to the 2015 general elections. Like in 2014, he has along with others returned to the PDP. Since his defection, his supporters across the country have been burning their brooms and embracing the umbrella. Like Makarfi, Kwankwaso is from the North-west, and except for the PDP governors’ support for Tambuwal, he has a very bright chance. Though unlike in 2015, Kwankwaso no longer controls the Kano State Government House, and has clashed with his former deputy, Abdullahi Umar Ganduje who succeeded him as governor. Also, founding fathers of the PDP are expressing reservations on his candidature. They are of the opinion that he was one of those who sent the party to the opposition. Shekarau, a former governor of Kano State and former Minister of Education, worked relentlessly during the 14-month legal battle in the party under the aegis of PDP Ex-Ministers’ Forum. One of his political allies confided in our correspondent that apart from being in the presidential race, he was asking the party to allow him get some Kano State politicians to fill certain slots including the running mate of the party’s governorship candidate in the state ahead of the 2019 general elections. He is seen as one of those serious about the PDP regaining power in 2019. He is also seen by many as a force and potent factor to reckon with. But some party leaders say his chances of getting the ticket are slim considering that he is facing trial on money laundering. Recently, Justice Zainab Bage Abubakar of the Federal High Court in Kano adjourned the trial of Shekarau and two others to October 18, 2018. He, alongside a former Minister of Foreign Affairs, Ambassador Aminu Bahir Wali and the North-west deputy chairman of the Goodluck Jonathan Campaign Organisation, Mansur Ahmed, were arraigned before the court by the EFCC on a six-count charge of conspiracy and money laundering to the tune of N950 million. It was recently reported that the PDP is searching for an untainted presidential candidate who would not be challenged by the EFCC. Bafarawa is a former governor of Sokoto State who has paid his dues in the nation’s politics. He is said to have national clout and eminently qualified for the ticket. A few days ago, a Sokoto State High Court discharged and acquitted him of alleged N13 billion fraud charges brought against him by the EFCC. Bafarawa, who was governor from 1999 to 2007, was accused of fraudulent transactions in a case has lasted over eight years. However, sinsiders say the ex-governor may not get the ticket on grounds that the EFCC could appeal the judgment at a higher court. He is the founder of Baze University and an economist of high repute who left the APC for the PDP last year. In April 2011, Baba-Ahmed defeated Ahmed Makarfi to clinch the Kaduna North senatorial seat. He was elected in April 2003 into the House of Representatives from Zaria Federal Constituency. He ran on the platform of All Nigeria People’s Party (ANPP). He is popular for his principled activism and being vocal against corruption. During the administration of former president Olusegun Obasanjo, he was among lawmakers who opposed Obasanjo’s third term bid. In May 2006, he said he would not run for re-election unless action was taken to investigate allegations that members had been bribed to support the constitutional changes needed for a third term presidency. Baba-Ahmed believes he has what it takes to clinch the PDP presidential ticket, especially considering his age, socio-economic and political experience. However, some party leaders say his chances are narrow on ground that he does not have the national outlook and clout to defeat President Muhammadu Buhari if given the ticket. Ibrahim Hassan Dankwambo, a former Accountant General of the Federation (AGF), Dankwambo has been governor of Gombe State since 2011, succeeding Sen. Mohammed Danjuma Goje who used to be his benefactor in the PDP until they parted ways when the latter joined the APC in 2014. Within the PDP, Dankwambo is seen as a heavyweight who can perform well if given the ticket. His modest achievements in Gombe in the last seven years have spurred him to contest for the presidency. Dankwambo’s presidential ambition had been a matter of speculation until last week when he officially declared his aspiration. Immediately after his declaration, he began meeting with leaders of the PDP at the various zonal levels. Saraki, Nigeria’s Senate President, has been nursing the ambition of becoming president since his second tenure as the governor of Kwara State. However, when it became apparently impossible for him, he settled for the senate in 2011. He contested and won election to represent Kwara Central that year. Saraki, along with other notables, became embittered in the PDP and ultimately left the party in 2014 to join the APC on which platform he won re-election to the senate in 2015. After he became senate president on June 9, 2015 against the wish of his party, the APC, Saraki went through a lot of trials, including the alleged false assets declaration trial at the Code of Conduct Tribunal (CCT) and the latest one, an alleged link to an armed robbery incident in Offa in April. The senate president finally rejoined PDP about a fortnight ago, ending months of speculation. Like Tambuwal, Kwankwaso, Atiku and others, Saraki’s quest to become president is not a hidden agenda, although he said on Wednesday at a world press conference that he would speak about his presidential ambition at the right time. Analysts however believe that he is only just delaying it, just as he did with his defection to the PDP. As the number 3 citizen in Nigeria, Saraki is a force to reckon with in terms of putting in a decent fight for the PDP presidential ticket. Apart from having Kwara State politically, it is believed that he has used his office in the last three years to reach out to top politicians in different parts of the country. It is believed that part of his consultations to contest for the PDP ticket was his meeting with Ibrahim Babangida in Minna on Wednesday. There are fears that the PDP may end up in a difficult situation if meticulous measures are not adopted to manage the various interests. But the party said it would deploy all democratic means possible and open opportunities to all returning members to on a level-playing field. The National Publicity Secretary, Kola Ologbondiyan, told Daily Trust that the returnees would be accorded due consideration in the build up to the elections. Ologbondiyan said there would be no crisis after the primary, adding that the mission is to collectively seize power from the APC and “rescue” the nation. “Be rest assured that they will be accorded their dues and rights as members of the PDP,” he said. 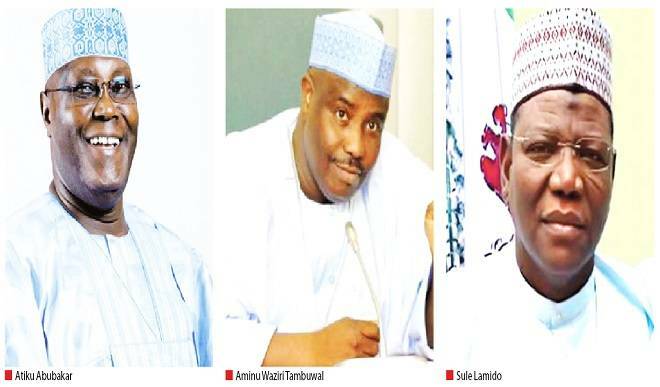 The party at its 81st National Executive Committee (NEC) meeting last Thursday, paraded an array of presidential aspirants and opened the space for those who just returned to the party to also join the race. A member of the Board of Trustees (BoT) who pleaded anonymity said, “In a very hot contest, the party will have no option than to allow delegates to make a choice.